A couple of days ago, I wondered what percentage of my life I listen to music. Fortunately, I figured out exactly how to calculate it. 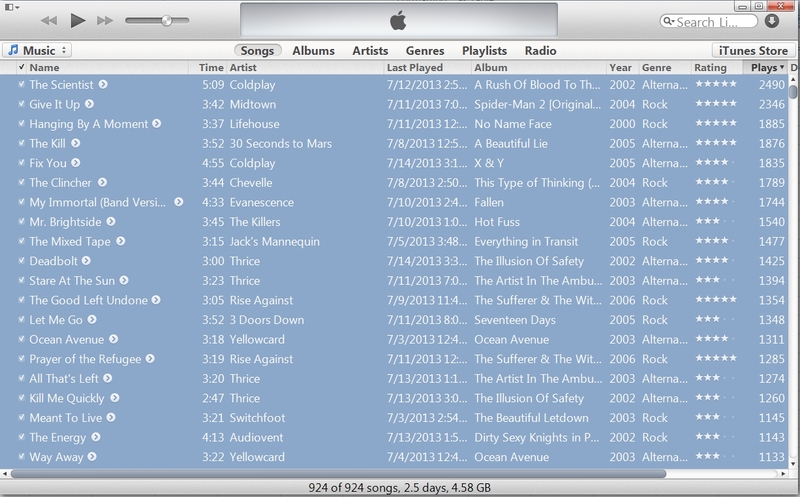 I have been using iTunes since I got my first iPod for my 18th birthday in 2005. Three computers and four iPods later, I have managed to preserve my playcounts for the last eight years. 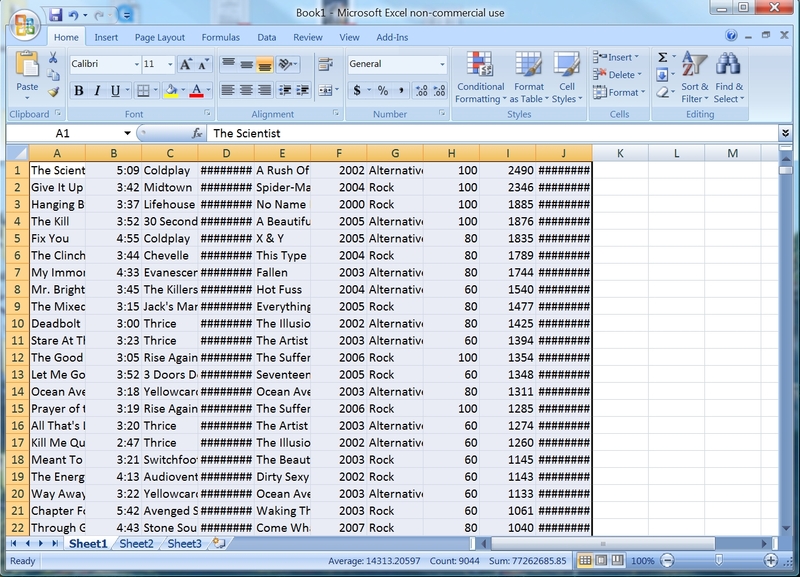 A little bit of Excel handiwork revealed that I have spent about 450 days listening to that music, or about an eighth of all my time. That’s about a quarter of all my waking hours! 2) Press CTRL+A to highlight all the songs and then press CTRL+C to copy them. 3) Open Excel and press CTRL+V to paste all the information. Surprisingly, the information nicely conforms to the cells. 4) iTunes gives a lot of information superfluous to our purposes. Ignore everything but the column for Time and Plays (columns B and I for me). 5) Create a new column by multiplying the time column by 24. 6) Highlight your new column (column K for me) and use the drop down formatting menu to convert it to a number. You might be thinking “why on earth are we doing this?” for the last two steps. Good question. This is part is fancy, so bear with me. 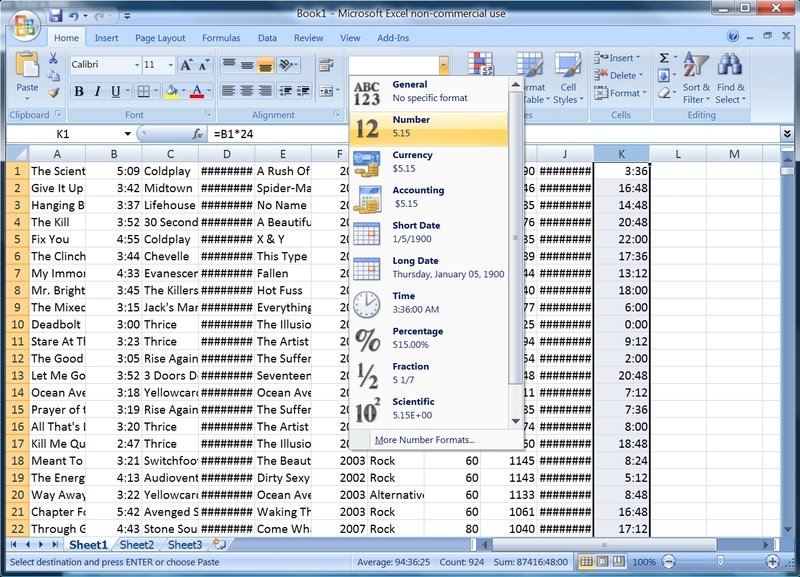 Excel treats the time column as a time of day rather than a number of minutes and seconds. For example, it thinks cell B1 refers to 5:09 AM, not 5 minutes, 9 seconds. Excel stores this information as a proportion of a 24 hour day. As such, it thinks of 5:09 AM as approximately 0.21458. Multiplying by 24 and converting it to a number gives us the number of minutes each song is. 7) Create a new column by multiplying the previous new column by the Plays column. (For me, this is multiplying column I by column K.) The result is the total number of minutes you have listened to each song. 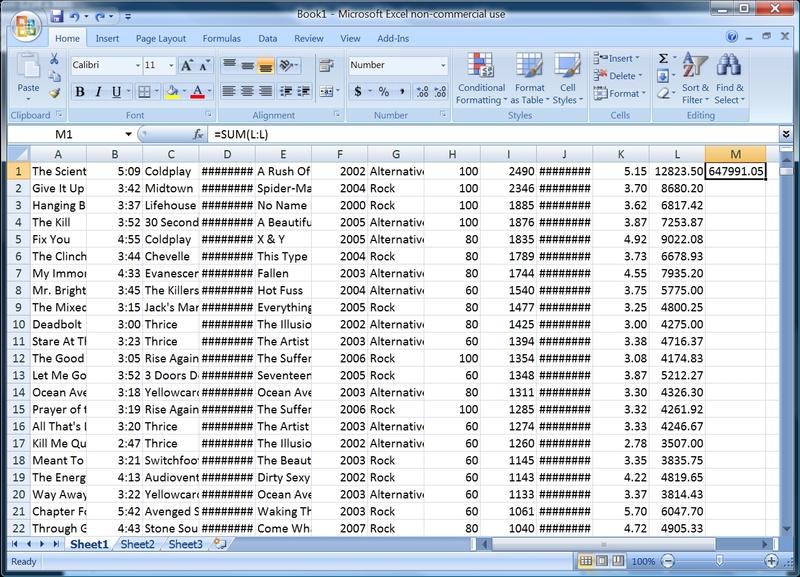 This in itself is interesting, and you can use Excel to sort the songs by the most time you have spent listening to them. This list can be quite different from your most played songs, as a 5 minute song counts for twice as much as a 2 minute 30 second song. 8) Use the SUM function to sum the column you created in step 7. This is the total number of minutes you have spent listening to iTunes. 9) Divide by 60 to get the number of hours you have spent listening to iTunes. 10) Divide step 9 by 24 to get the number of days you have spent listening to iTunes. 452.11 days, but I’m sure you’ve topped that by now, given another 8 months. I have my iTunes data saved since Feb. 2005 as well. By the way, am I reading your screenshots correctly? You’ve listened to one of your songs over 2000 times? Wow, my top played is just over 100 times. I try to listen to my entire library of songs somewhat equally using smart playlists though. Yeah, that’s right. I don’t do much in the way of variety. got 31.54 days 😮 And had the ipod for like half a year. Thanks so much for this! By the way everyone, if you have any songs longer than an hour, this way won’t work for those songs. I just changed my one 2 hour techno mix song manually.